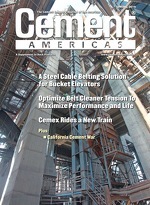 New Orleans will host the 15th annual Intercem Americas – a leading cement industry conference – Dec. 2-4, 2013, at the InterContinental Hotel. Intercem will provide the latest forecasts, markets news and trading patterns, as well as insight and analysis on shipping and environmental regulations for the U.S. cement industry and the wider Americas region. Portland Cement Association (PCA) Chairman Cary Cohrs and PCA Vice President and Chief Economist Ed Sullivan will provide an analysis of the North American markets. According to a recent forecast from the association, cement consumption will increase a modest 4 percent in 2013, followed by 9.7 percent consumption increase in both 2014 and 2015. An 11 percent consumption gain is predicted for 2016. The prospect of near double-digit growth for the next three years is amongst the best in the world. Should the market grow at the projected rate, the United States could see a 34-35 percent growth by 2017, behind only Nigeria, Indonesia and India, according to forecasts from Exane BNP Paribas. Growth in Latin America and South America is expected to continue apace with demand, which is projected to increase between 23 and 26 percent over the next 5 years. Though the forecasts bode very well for construction and cement demand, other challenges arise, for example in the form of new environmental regulations and growing fuel costs, particularly in the United States and Canada. For more information, visit www.intercem.com.